In recent months Pinterest has blown up as the new social media space with some uninformed tech journalists going as far as calling it the new Facebook. That is an overstatement but it is an interesting new Social Media space. This article isn't an introduction to Pinterest per say, there are plenty of those around, but I will just say, if you haven't tried Pinterest out it is worth a visit. 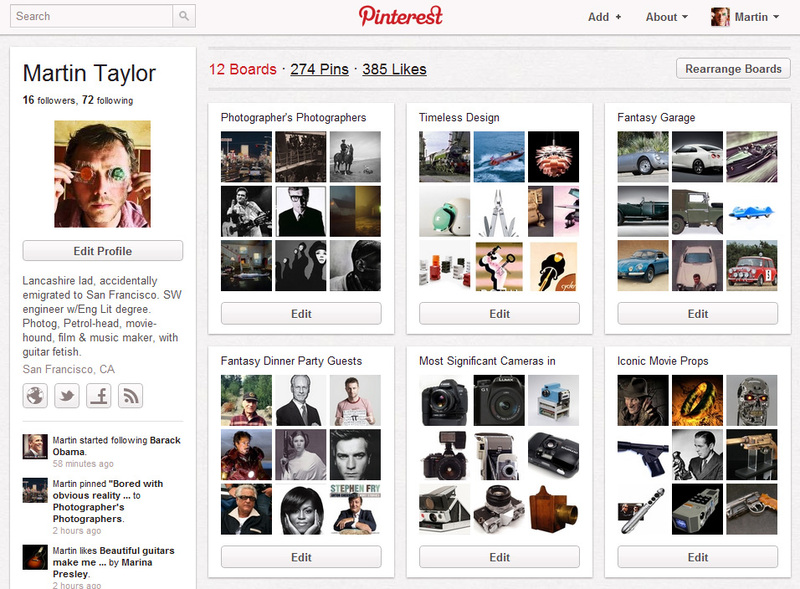 Pinterest is your categorize-able, mood-board. If you see something you like on the web; you pin it and an image, your description and a link to the source is added to your board. It's that simple. But Pinterest does have a reputation as girly hangout. I don't think anyone really knows and that people are guessing but you read pundits saying that 87% of active users are women. At first blush this statistic could be believable. Certainly the most popular pins do feature a disproportionately large number of interior design, sappy wedding and child photography, hair and nail styles, outfit and shoe options, too-cute-pets, recipes, diet tips, Ryan Gosling portraits, platitudes in text, book storage havens, etc. If you're a guy, don't let this put you off. There is plenty at Pinterest for you too. Since when has making lists for fun being a predominantly female activity? Men grow up making lists (ref "High Fidelity"). "What is your top five dream cars?" "I really like that album but it isn't in my top 10. Top 50, maybe." When I grew up the Top Trumps card games were a huge craze in the playground among boys. You had to remember huge lists of esoteric facts about super-cars or footballers to be able to be able to win. Can't you boil sports down to huge lists of stats? Isn't fantasy football just pitting one man's list against another's? Don't men out number women with Asperger Syndrome 4 to 1? It's men who catalog their record, CD, comic collections - women have better things to do (like hanging out on Pinterest). Companies are springing up trying to be the Pinterest for men (Manteresting and Gentlemint). Do we really need our own man cave for creating mood-boards? Some forum with a "Smelly Girls Keep Out!" sign on the club house door? Wasn't this just about any forum on any subject a decade ago? I'm not sure I want to go back to the internet that smelt like a men's locker room so I'm no hurry to leave Pinterest for an all male preserve. 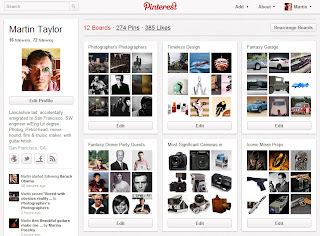 Pinterest is the market leader with the best features and the most traffic so why go off into some male ghetto? 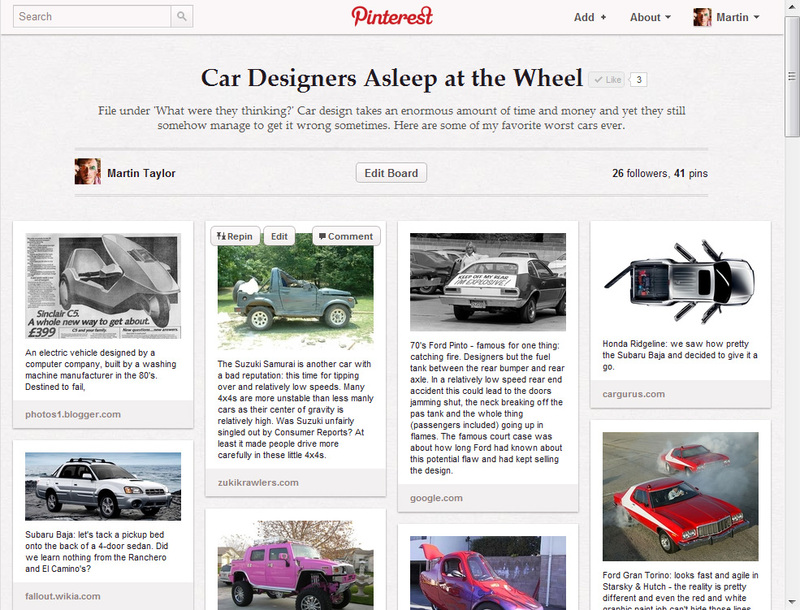 If you have slightly OCD tendencies Pinterest may be your idea of heaven, be you male or female. 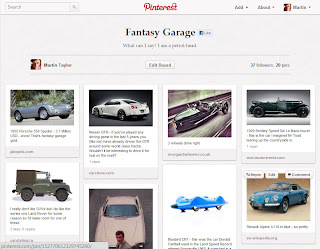 If you are male and find Pinterest appealing what might you use it for? Any of the previously mentioned male lists would be at home on Pinterest: your favorite album covers, sports personalities, movie posters etc. Personally I find Pinterest a great way to collect things with out bringing more crap into the house. Last week, for example, I went on a nostalgia trip remembering my childhood in the late 70's early 80's (yes, I am old, thanks for asking.) I stumbled upon toys, candy, TV shows, music, etc from those days and I created a board to store it all of course. This board may be uninteresting to anyone but me or maybe other 40-something Brits but now, when I want to stroll down memory lane, all this stuff is in one place. In the past I might have gone on a spending binge trying to find a Six Million Dollar Man doll on eBay, candy from the time at some specialty store and horrible music I won't actually listen to again from iTunes. Pinterest let me indulge in nostalgia without the cost or clutter and it allowed me to share some strange stuff from my childhood with my wife. In the future, when someone kick-starts my failing memory with a "Do you remember ....?" I'll have a place to store that if I want to. In a more obvious vein, I don't lust after clothes or storage solutions in the way many Pinterest users seem to but I have an obsession with cars and guitars. 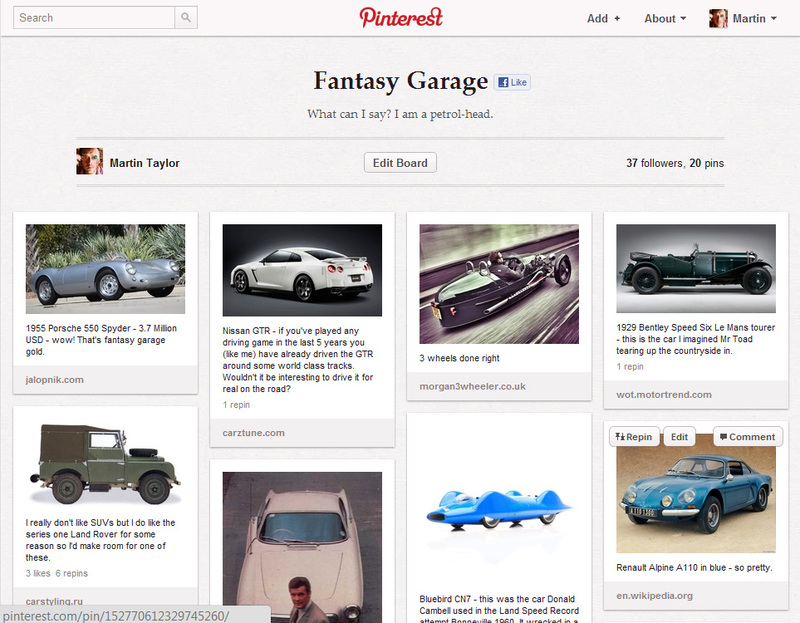 Pinterest allows me to collect rare guitars like a rock star and to stock my fantasy garage like a CEO. But the boards you create don't have to be about things you aspire to or want. Continuing with my petrol-head tendencies I created a board of the worst cars ever made. Not only does it counterpoint my fantasy garage nicely but where would I store this list otherwise? Here on my blog perhaps? Maybe, but Pinterest boards become a living document rather than a static list. You can leave them for a awhile and them come back and add to them when inspiration strikes. You can leave them for a awhile and them come back and add to them when inspiration strikes. Creating boards is so easy, if while I'm nerding out, creating my list of the Greatest Fictional Spacecraft, I come across the inspiration to start a list of Iconic Movie Props it is the work of a little extra tying and a click. 'Isn't Pinterest about community?' I hear you ask. Where do you go to find other dudes on Pinterest? There are the obvious places like the Cars and Motorcycles, Sports and Geek sections among others. There are various people who have curated lists of men to follow on Pinterest (Sean Percival, Joe, etc). Beyond that you just have to keep you eyes open for stuff that interests you. Try to search for boards, people or pins tagged with a subject you're interested in. When you find good boards, follow them. When you find pins you like, take a moment to comment. I was never any good at the whole 'popular' thing in High School so it should be no surprise that I am the wrong person to ask about playing this game on Social Media sites. There are plenty of articles telling you how to get more followers on Pinterest: this isn't one of them. I follow boards rather than people that I find interesting. The problem with following a person is whenever they create a new board you will automatically be following it weather it is of interest to you or not (often not). I only follow people I actually know because they will be pissed at me otherwise. I don't repin things very often but I tend to find my own content while I'm out and about on the web. If you pin three new cars to your fantasy car garage at one only the first one is likely to be see in the Cars and Motorcycles section. When you don't many followers getting pins into those sections is the only way you will get more eyes on your pins. Portrait ratio photos get more physical space than landscape one. Bigger images have more impact. Tall, skinny images will get the most physical space (hence those really long, skinny graphics people are making and posting (spamming) specifically for Pinterest. When you are looking for an image to pin on a subject try to find a portrait ratio image though. 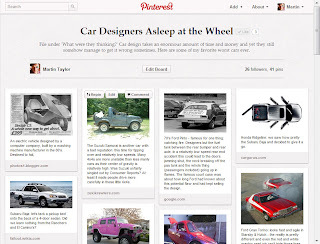 Pinterest isn't purely visual: you do get chance to write something about your pin. This is your chance to express yourself. I find pins without a personal comment dull: I want to know what the thing is and why a person pinned it. Curation may be the next artistic activity that has been democratized. Previously you had to be a magazine editor or art gallery manager to have this kind of power. Of course, these professionals are still going to have more influence and have a greater effect that you but Pinterest does give you a taste of this kind of task. I definitely have pride of ownership of my boards. I do feel like they partly describe who I am. Curation is not the exclusive preserve of women so I am encouraging you, especially if you are a guy, to get out there and to start pinning. Is Pinterest a man-free zone? Hey, great write up. Have a look at Dudepins, we are getting set to launch soon!